New information technologies change the privacy and data protection risks we are facing in a bilateral way: although new risks (e.g. through ease of search, cheap data storage) emerge, technology can also help to minimise or avoid risks to privacy and data protection. The idea of shaping technology according to privacy principles has been discussed since many years, addressing among other the principles of data minimisation, anonymisation and pseudonymisation. This led to the term Privacy Enhancing Technologies (PETs), which covers the broader range of technologies that are designed for supporting privacy and data protection. 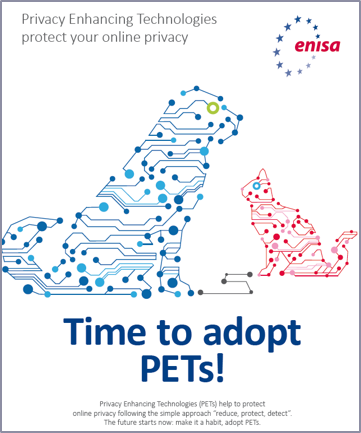 ENISA has been active in PETs for many years, collaborating closely with privacy experts from academia and industry, as well as following relevant research and development in the field through platforms like the Internet Privacy Engineering Network (IPEN) and relevant conferences. Our most prominent activity to this effect is the organisation of the Annual Privacy Forum, which aims to bring industry, research and policy makers together in discussing privacy technologies. One of the main aspects of our work is to analyse the technology readiness of PETs and facilitate relevant research platforms and activities of privacy experts. In 2015 we published a Report on Readiness Analysis for the Adoption and Evolution of PETs, which we intend to follow up with a design of PETs evaluation platform in 2016. One other dimension of our work is that of online privacy tools for the general public. Taking into account the vast availability of such tools on the internet today, our aim is to define a methodology for their assessment and comparative presentation, so as to support the end users make the right choices. Our first Report on Online Privacy Tools for the General Public was issued in 2015 and will be followed this year by the publication of a PETs control matrix for online and mobile tools. If you would like to get more information, please also visit our related section on Privacy by design.